Who's a crazy sock knitter??? Apparently, I am. 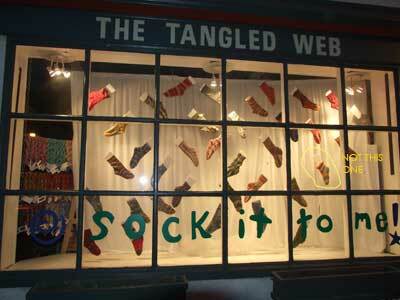 Mary decided to do a sock-themed window display this month. When all the socks were displayed, we realized that I had knit every one of them, except one (the rainbow-y one with the loopy top). Now that's CRAZY. Wow, I was going to ask if any of those socks have mates! Do you have a bit of a reputation?? dk - Since most of these were store samples, I had the elusive pleasure of only having to knit one!!! cg - Second Sock Syndrome is well-known in the knitting community. However, I do not (generally) suffer from it. Mostly because I make really uncomplicated socks. I LOVED the window display. Very clever!! My security code sounds like I'm choking! "hgavgrgx"